Nothing new. 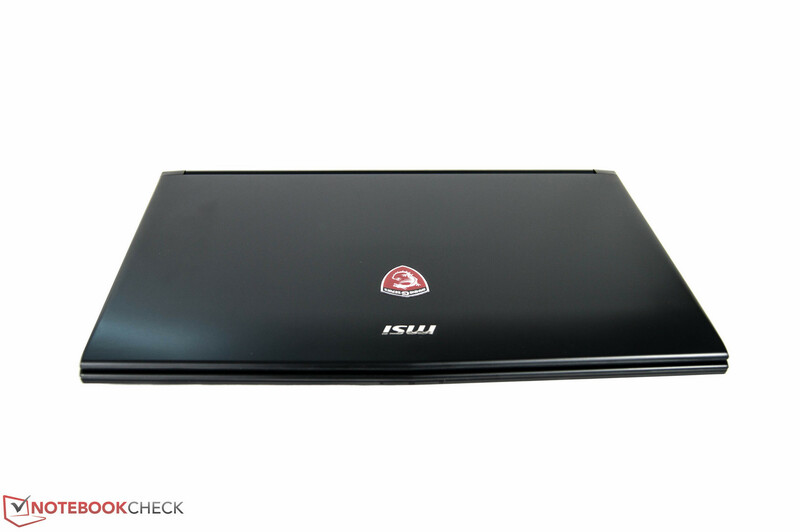 MSI has given its entry-level 17-inch GL72 a hardware update. The new service package is enough to enjoy Full HD resolution adapted to the current gaming world. However, the device cannot offer any other improvements or innovations. For the original German review, click here. 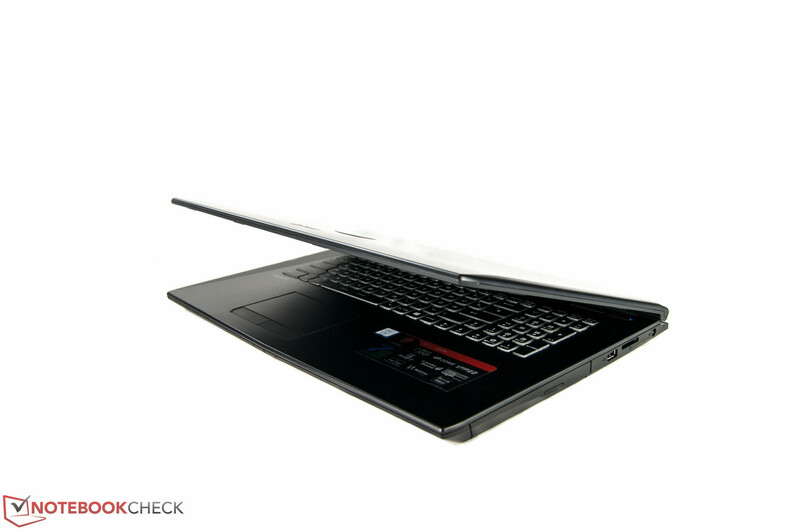 With the GL72 series, MSI has tried to prove that 17-inch entry-level devices can be successful. Our test unit of the gaming notebook is equipped with a modern, top-level Intel Core i7 processor and a dedicated Nvidia GeForce GTX 1050. It is available for $1100 which is relatively affordable for a 17-inch gaming laptop. This is not the first time that we have taken a closer look at the GL72 series. We were able to review the gaming notebook configured with an Intel Core i7 6700HQ and an Nvidia GeForce GTX 960M more than a year ago. Therefore, we would like to include this predecessor as a comparison device for this review. Asus has a notebook similar to the current MSI GL72 available. 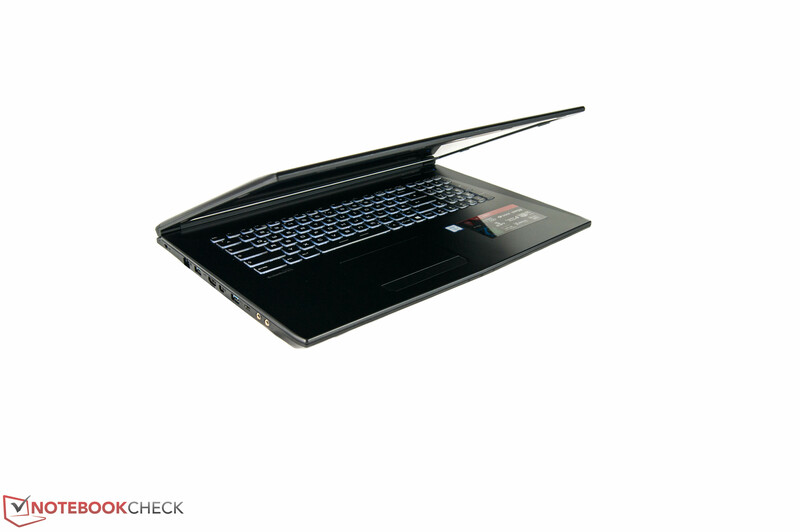 The Asus ROG Strix GL753VD that we tested had the same performance characteristics. Depending on its configuration, this device is available for $1360 to $1400. To widen our range of comparable devices, we have also included 17-inch alternatives with the stronger Nvidia GeForce GTX 1050. 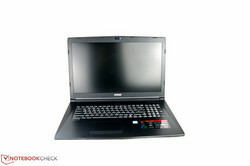 These include the Asus GL753VE (available for $1300) and the Acer Aspire V17 Nitro. MSI also has a similar device with Ti graphics available: the GE72. MSI has stuck to what it knows best - the GL72 looks just like its predecessor. The matte black case is made entirely from plastic and extremely prone to fingerprints. Just like last time, the test device shows some weaknesses. The keyboard unit and display lid give way too easily and the narrow hinges give a good impression: the large display stays firmly in position. However, you need both hands to open the notebook. Like its predecessor, the battery cannot be removed easily. 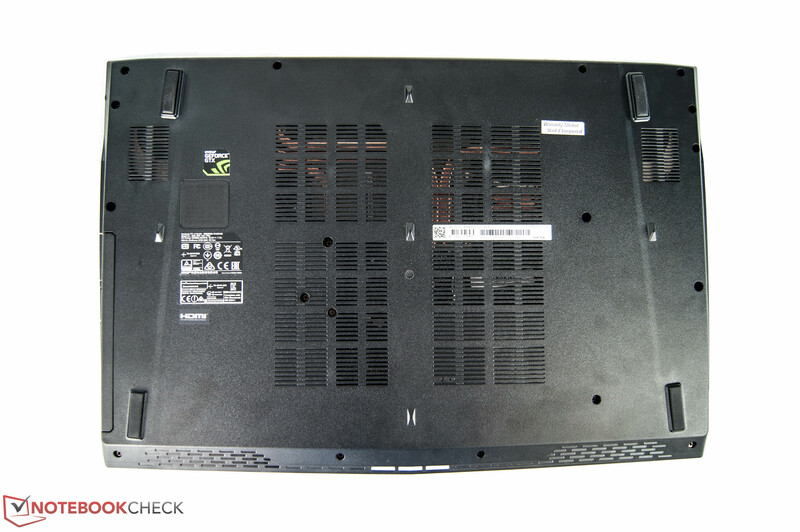 The plastic case of the new MSI GL72 weighs 3 kg (~6.6 lb) and is about 200 g (~7 oz) heavier than that of its predecessor. But this may not be solely due to the improvements. The previous test unit was equipped with an M.2 SSD instead of a 2.5-inch hard disk. The US version is equipped with both an M.2 SSD and a hard disk while the German test unit had only an HDD available. 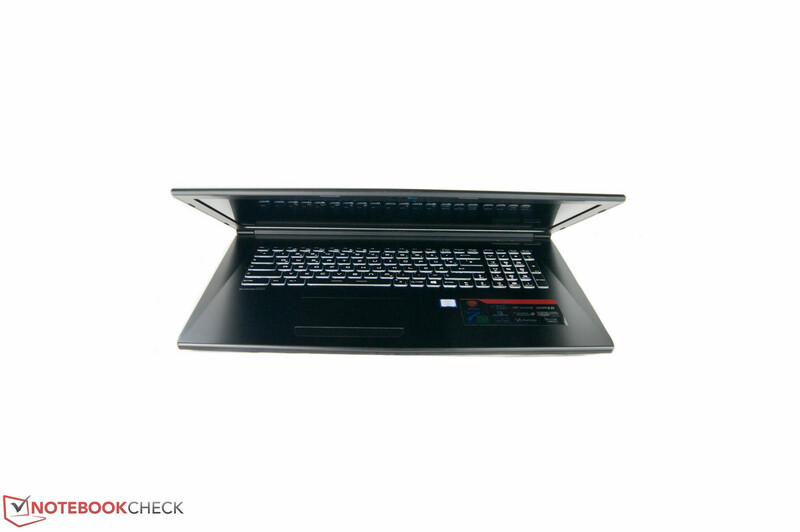 Overall, the GL72 is still rather light-weight and comfortable for a 17-inch device. Its competition weighs about the same despite some of the devices having stronger components. 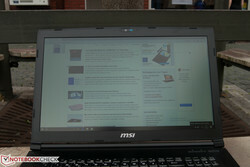 The MSI GL72 is designed to have all permanently connected devices on the left side of the notebook. On the right side you can, for example, connect a mouse via a USB 2.0 connection. As the ports lie in the middle on the left side, they are easily accessible. Unfortunately the USB Type-C does not support Thunderbolt. The HDMI port supports 4K resolution, but only at a frequency of up to 30 Hz. In order to test the speed on the SD card reader, we always use our reference card, the Toshiba Exceria Pro SDXC 64 GB UHS-II. The AS SSD benchmark and manual copying of JPG files (each about 5 MB) confirm the meagre transfer rates of about 20 MB/s. If you copy files from SD cards regularly, you might want to consider an external card reader or even another product. If you take a look at the comparison devices, you will see that transfer rates of 80 MB/s are quite common. MSI has chosen the Intel Dual Band Wireless-AC 3168 to take over wireless network connection with a (gross) speed of up to 422 MBit/s. On top of that, it offers Bluetooth 4.2, with which we measured client transfer rates of 305 MBit/s. As a server, we measured an average of 342 MBit/s. These results are rather poor in comparison to its competitors. The Asus ROG Strix GL753, for example, reaches an average of 666 MBit/s (as client). No interesting accessories came with the device and we could not find any peripheral equipment on the manufacturer's website either. 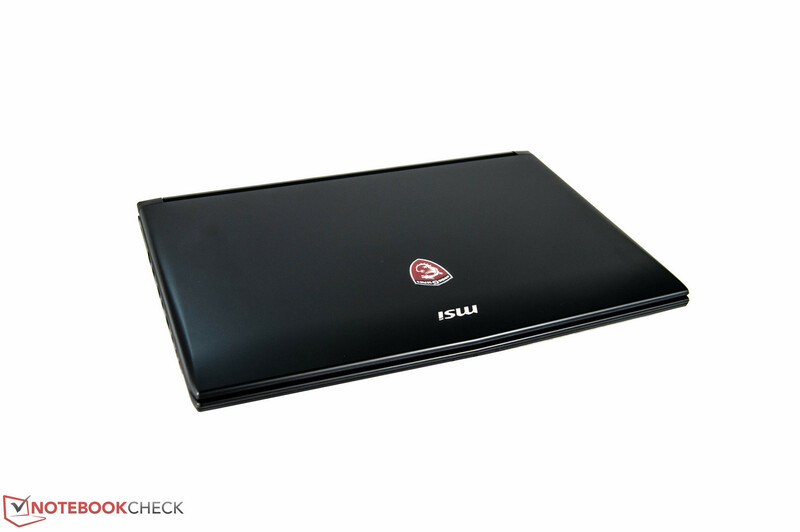 However, on its website MSI does offer accessories that match the laptop's looks. As the device has no maintenance hatch, the entire bottom cover needs to be removed to do any maintenance work. In order to do this, you need to unscrew 19 screws, one of which is hidden beneath a sticker about warranty. The plastic case is additionally held in place by plastic clips, so caution is needed when lifting the cover off the base unit. We were forced to stop at this point so as not to damage our right to claiming warranty. We could, however, tell that one of the two RAM slots was in use and that the layout was almost identical to the previous MSI GL72. A lot of screws hide the view into the inside. The manufacturer offers a two-year warranty (pickup and return) from date of purchase. Please see our Guarantees, Return policies and Warranties FAQ for country-specific information. 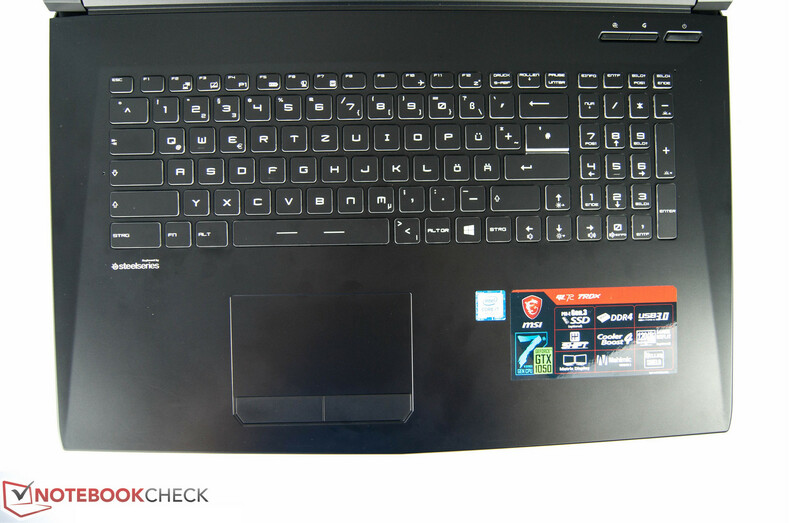 MSI has equipped the GL72 7RD-028 with a black chiclet keyboard. It has good travel and clear pressure points, which is a great plus. The keys do not give way too much in the corners either. The test unit has a German QWERTZ keyboard with a slightly altered layout that takes a bit of getting used to. We cannot say if the English version offers a standard layout or not. It was nice to see the large arrow keys and number pad. Our test unit also has a three-level white backlighting, which the predecessor did not. 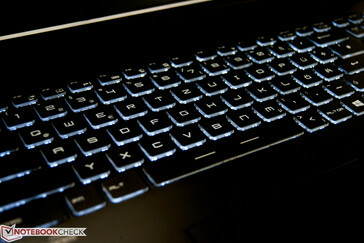 The touchpad is 10.7 x 6 cm (~4.2 x 2.4 in) large and has a smooth surface with fast response times. Unfortunately, it is no better than the case in terms of fingerprints, which are easily visible. We had no complaints about input. 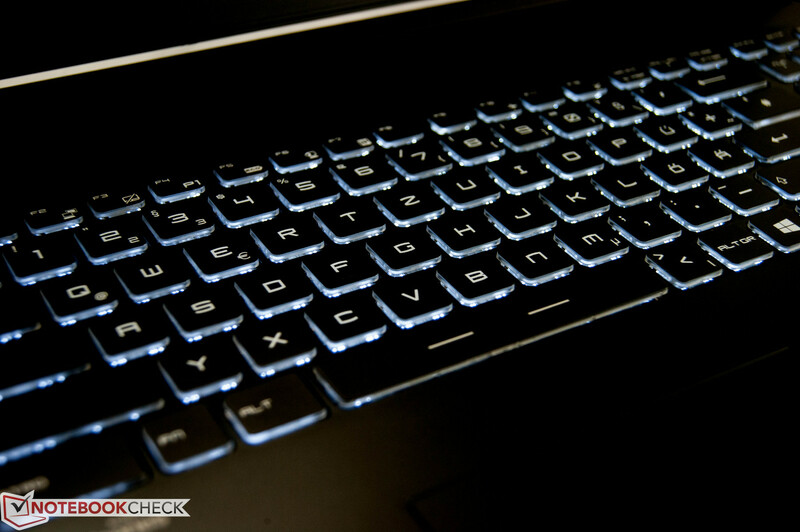 The touchpad responded quickly and smoothly even to multitouch gestures such as scrolling through websites. It does not register input well in the corners, unfortunately. The two mouse buttons have short and clear pressure points. The click sound they make is quite muffled, but not quiet. The large 17-inch display has a Full HD resolution of 1920x1080 pixels. This corresponds with the performance of the Nvidia GeForce GTX 1050. Most new games can be played smoothly in high quality with this configuration. The German device is equipped with a TN panel from the manufacturer Chi-Mei. Apart from our MSI comparison devices all competitors feature higher quality IPS displays with stable viewing angles. As an alternative, MSI offers a display with a refresh rate of 120 Hz instead of 60 Hz. We took a closer look at this increased frequency during our testing of the MSI GE72. We measured an average brightness of about 240 cd/m². This result shows an improvement by about 60 cd/m² in comparison to its predecessor (MSI GL72 6QE). A look at the results of the comparison devices shows that these values are below average for this level. Asus' comparison device, for example, can reach about 350 cd/m². The brightness distribution is disappointing at 80%. We noticed just a slight clouding on either side of the screen. The gaming notebook manages to produce good black values with a contrast of 1200:1. The CalMAN results were not as pleasing ex-works. We measured a Delta E deviation both of about 13 for both colors and gray scales. Particularly disappointing: a very noticeable blue cast. Calibrating the display made an improvement. Afterwards, the average gray scale deviation was at just 1.35 and color deviation at 2.28. 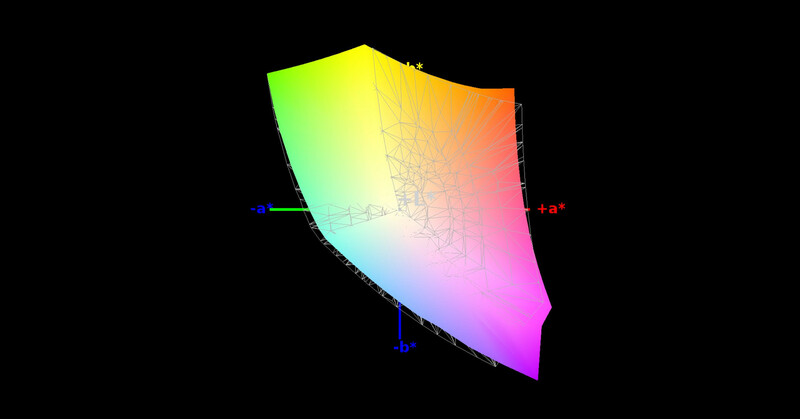 Last but not least, we took a look at color space coverage. This is quite good at 94% of the sRGB color space. 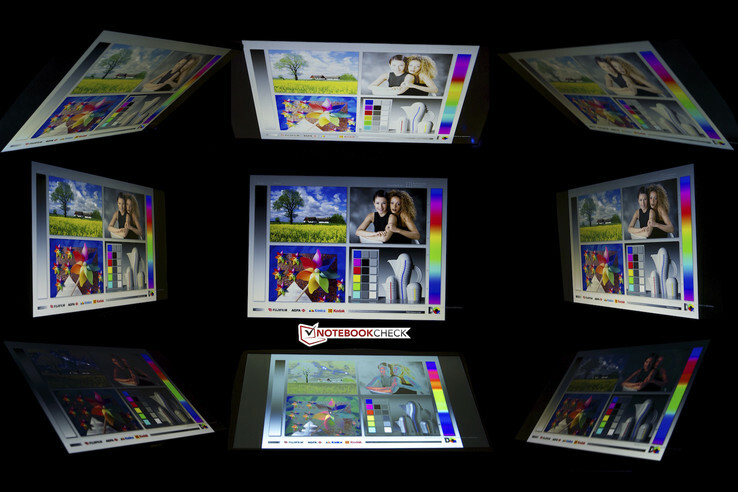 The larger AdobeRGB color space is covered to 60%. 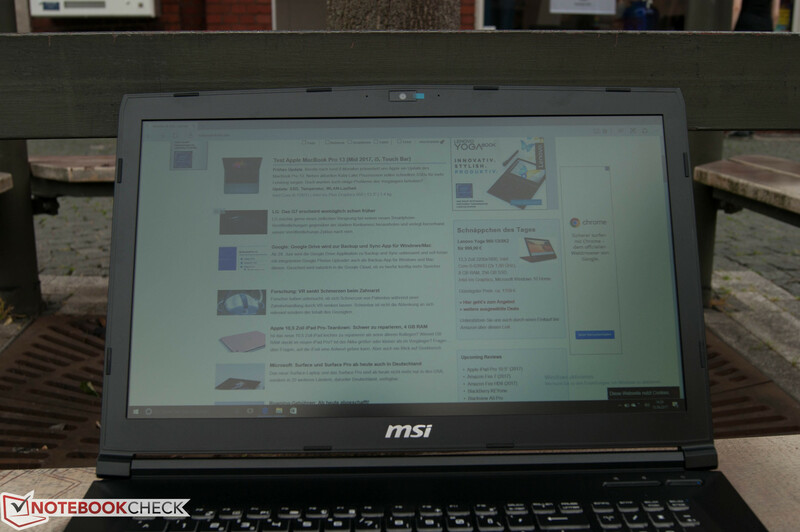 Thanks to the matte display and great brightness levels, the gaming notebook can be used outside. However, we would recommend staying in shady areas and avoid direct sunlight. In comparison, all tested devices range from 0.9 (minimum) to 636 (maximum) ms. » 15 % of all devices are better. 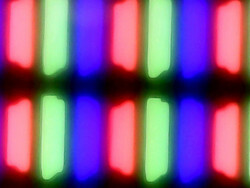 The display backlight flickers at 961 Hz (Likely utilizing PWM) . 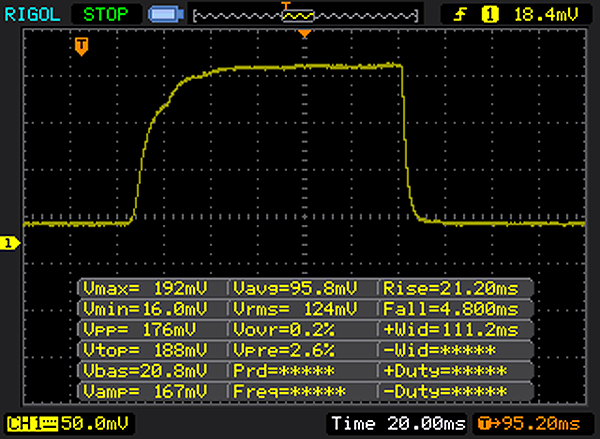 The frequency of 961 Hz is quite high, so most users sensitive to PWM should not notice any flickering. Choosing a TN panel means accepting limitations in terms of color and brightness levels from wider viewing angles. So the display has rather poor viewing angle stability. Thanks to the large opening angle of almost 180° the MSI GL72 can be adjusted to almost any position. 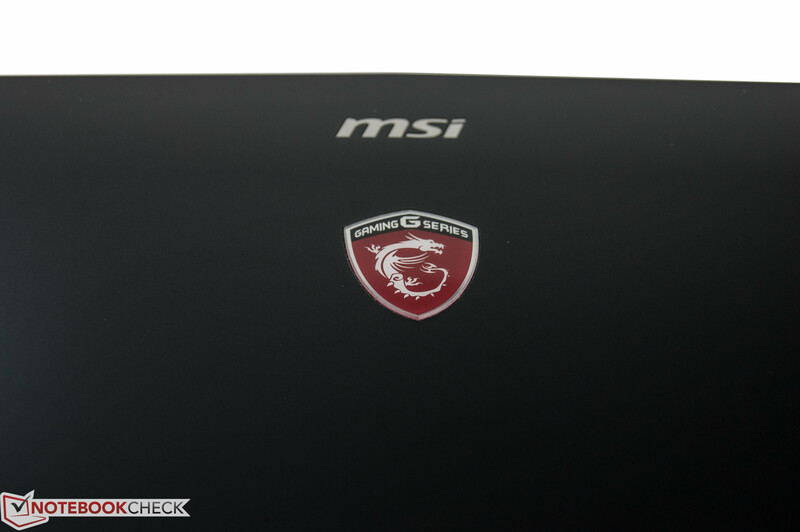 The new MSI GL72 is supposed to offer a Full HD experience in a 17-inch format. The CPU is one of the fastest laptop processors of the Kaby Lake generation. The mid-range Nvidia GeForce GTX 1050 displays most of the current games smoothly in Full HD resolution. For its GL series, the manufacturer has foregone the Ti version, which is up to 30% faster. The storage solution in the German test unit is a hard drive with a capacity of one terabyte. Fortunately for readers living in English-speaking countries, their version has 16 GB of RAM rather than the 8 GB in the German version and an additional 128 GB SSD. Our test device is equipped with an Intel Core i7-7700HQ of the Kaby Lake generation and is classified as a high-end processor. 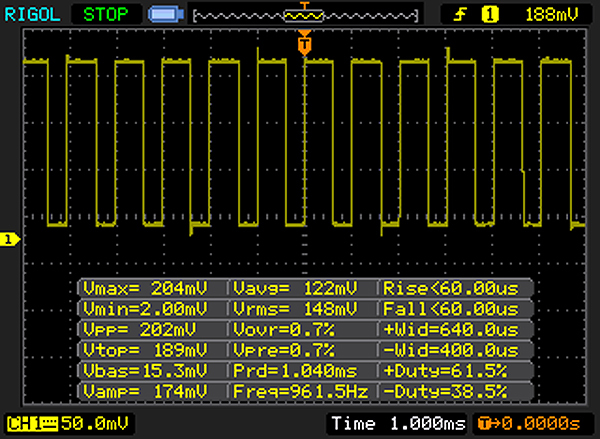 The clock rate is between 2800 MHz and 3800 MHz. The biggest difference compared to its Skylake predecessor Intel Core i7-6700HQ is in the clock rate, which has increased by 200 MHz. There is no change in power consumption: Intel claims a maximum power consumption of 45 watts (TDP). To test its real performance, we did the Cinebench R15 benchmark. 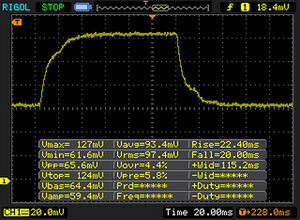 The test device achieved 731 points in the Multicore test, which matches our expectation. The clock rate remained at 3400 MHz throughout the test. The competition runs at a similar level. 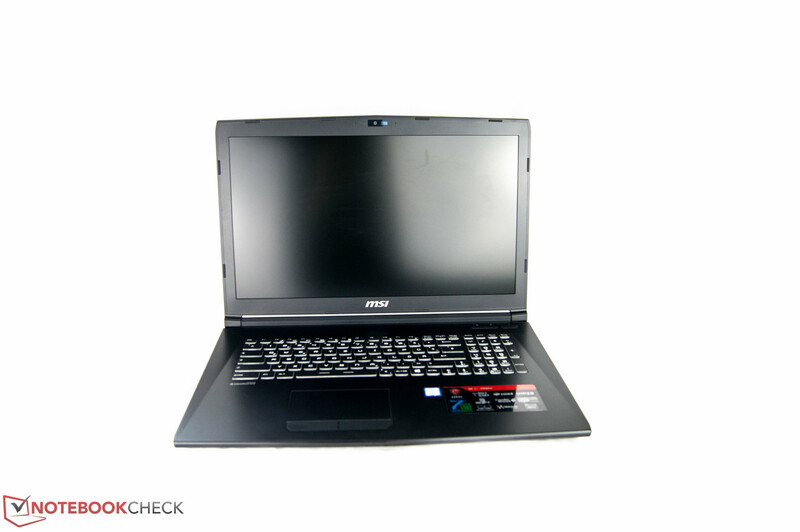 Only the Acer Aspire Nitro BE VN7 cannot keep up due to its weaker Intel-Core-i5-7300HQ processor and reached only 515 points. That is 50 points difference compared to our test unit's predecessor. We use the Cinebench R15 loop to measure how performance changes over a prolonged period of time. At first, the score fluctuates minimally and finally levels out at its normal level. 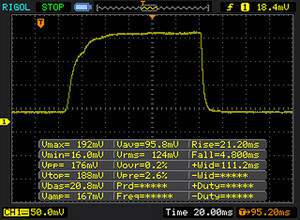 The result stays the same even after disconnecting from the power supply. 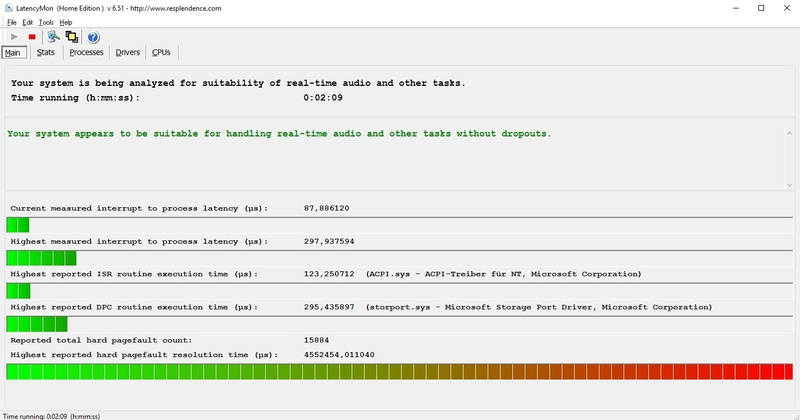 You can compare more CPUS with our CPU Benchmark Tool. The device's potent hardware ensures that system and software run smoothly. As the German device version is not equipped with an SSD, the MSI GL72 is in the last place in our comparison of PCMark 8 Home benchmark results. 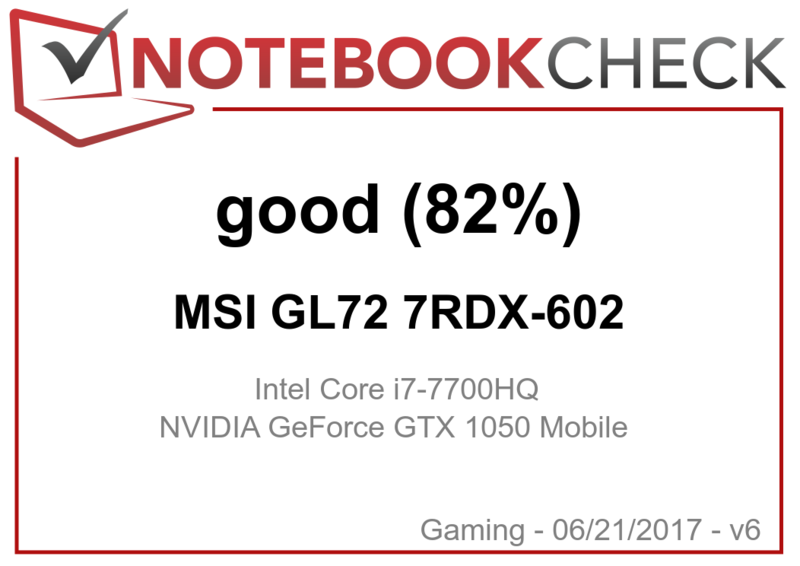 Last year's MSI GL72 6QE had a higher value thanks to its SSD storage. The English version is equipped with both 1 TB of 7200-RPM hard drive and 128 GB of M.2 SSD storage. For the hard drive, we measured sequential read and write rates of about 130 MB/s with the CrystalDiskMark test. The important 4K values are at just 0.582 MB/s during the read test and 1.022 MB/s during the write test. The competition that is equipped with PCIe SSDs has a clear advantage in our comparison. Their sequential read rates are over ten times faster than those of our test device. MSI has chosen an Nvidia GeForce GTX 1050 to take care of the device's graphics. This seems a little unusual as most 17-inch devices that we have tested are equipped with the stronger Ti version. In our case the GPU has a core clock rate of 1354 MHz and a GDDR5 memory of 4 GB. We have analyzed its performance and compared it to the Ti version with the help of the 3DMark benchmark. The device scored 5622 points in the Fire Strike test. That is about 150 points less than the Asus Strix GL753 with the same configuration. The Nvidia GeForce GTX 1050 Ti reaches 7000 points, which is clearly a lot better. Further down, we will take a look at what effects these results have on real-life gaming. The Nvidia GeForce GTX 960M used in the previous version reached a score of 4340 in the Fire Strike test. If you like to use your laptop without power supply for short sessions, you will have to accept substantial losses in graphics performance. The result of the 3DMark 11 sinks from 7594 to just 2541 points on battery. You can compare more GPUS in our benchmarks list. As mentioned already, the Nvidia GeForce GTX 1050 shows its strength during Full HD gaming. Most current games can be displayed smoothly with high or medium details. As the games "Rise of the Tomb Raider" and "The Witcher 3" show, the Ti version of the graphics unit is clearly stronger and makes gaming even smoother. With high settings it can produce up to 10 FPS more. To find out which games can be played with the inserted graphics unit and how well other GPUs do, take a look at our article "Computer Games on Laptop Graphic Cards". The MSI GL72 makes hardly a sound while idling. We measured a maximum of 31.8 dB(A). 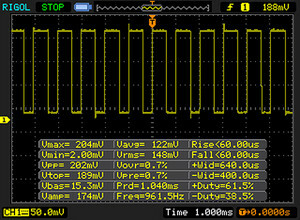 Even under load the system noise is comfortably low. The maximum value under load is 43.6 dB(A). It also has a good frequency and is not disturbing. In Turbo mode the rotation speed of the cooling fans can increase. In that case, the noise level rises to up to 50 dB(A). The comparison devices confirm that these are normal values. There were no real exceptions. Only the Nexoc G739 reaches 50 dB(A) even without Turbo mode. The device hardly heats up during day-to-day use, but can reach temperatures of up to 43 °C (~110 °F) under extreme load. Even cooler: The Asus ROG Strix GL753 does not even reach 40 °C (~104 °F). We then took a look at core temperatures and clock rates. 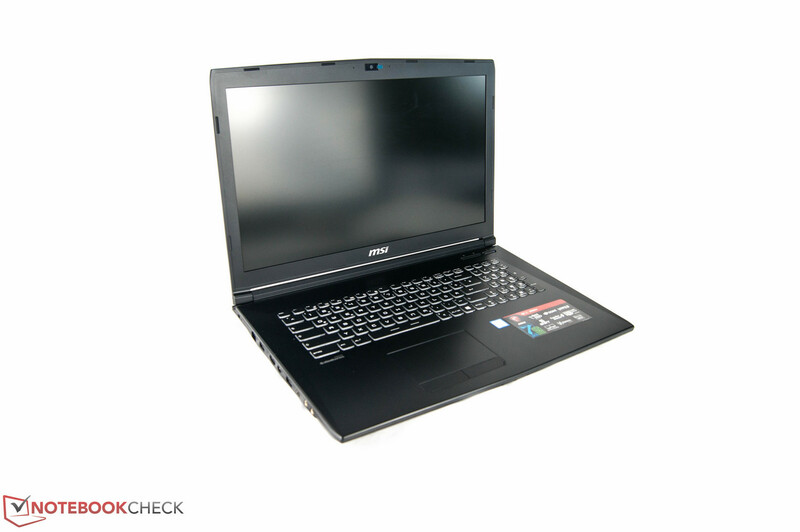 We put the MSI GL72 under stress with the help of Prime95 and FurMark. 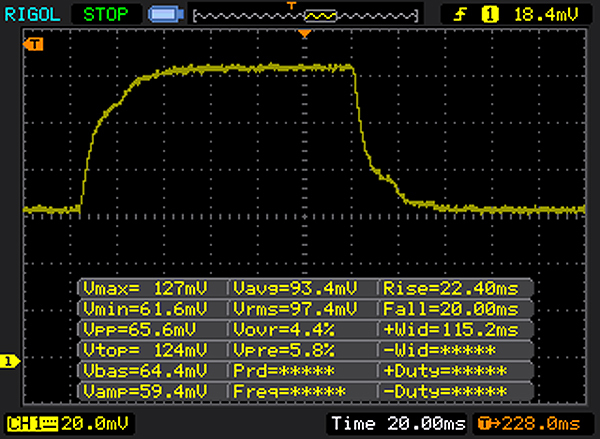 But even after an hour, our test unit was still running at 3.4 GHz. The CPU temperatures were a little surprising however. Occasionally, they almost reached 100 °C (~212 °F). (±) The average temperature for the upper side under maximal load is 36.2 °C / 97 F, compared to the average of 32.9 °C / 91 F for the devices in the class Gaming. (±) The maximum temperature on the upper side is 45 °C / 113 F, compared to the average of 39.3 °C / 103 F, ranging from 21.6 to 68.8 °C for the class Gaming. MSI has installed four 2-watt speakers into the device. The speakers are satisfyingly loud and sound good enough for watching occasional TV-series or YouTube videos. The sound profile is OK even though there is no bass. We would recommend using subwoofers. The current MSI GL72 uses a lot less power than its predecessor, but 9.6 to 16.5 watts is still quite a lot. Under load consumption increases to up to 130 watts. The provided power supply is large enough with 150 watts. 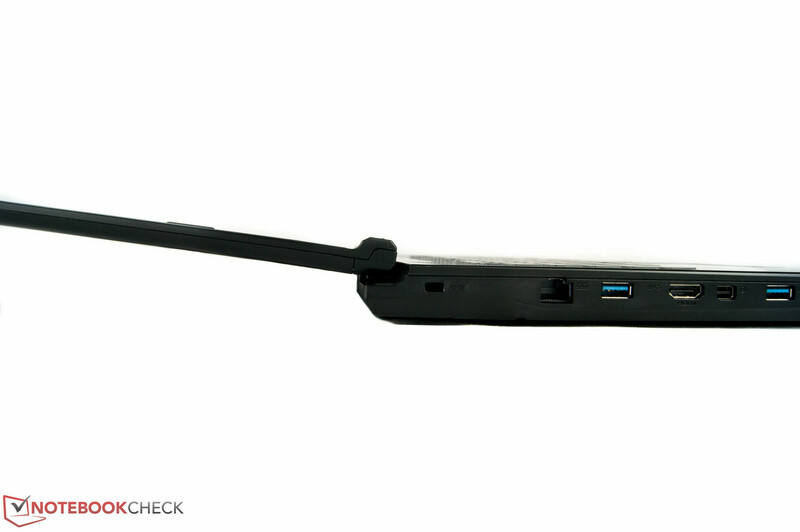 A lithium-ion battery is meant to keep the MSI GL72 going, even when it is not connected to an external power supply. The battery seems equivalent to that of its predecessor: six cells and a capacity of about 43 WH. 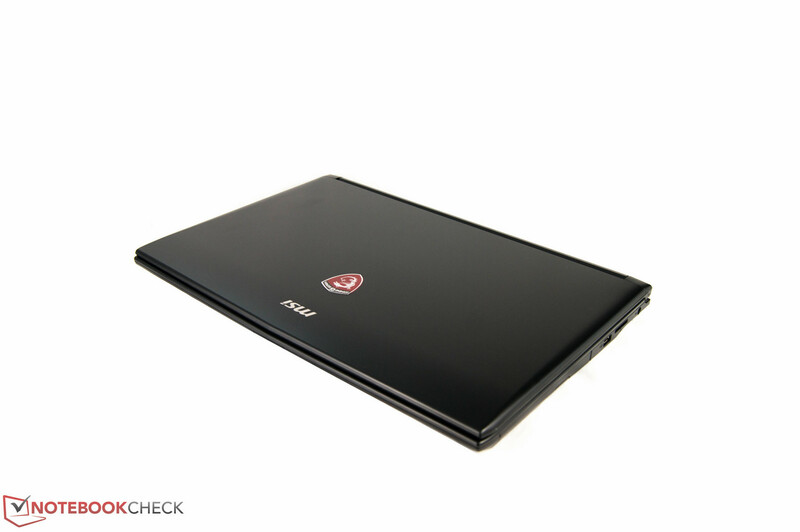 The previous MSI GL72 already had difficulty with its battery runtime. Nothing has changed since then. With communication modules turned off and brightness set to minimum, the device only just manages to run for 5.5 hours. We tested its stamina in a practical scenario: surfing on the web. The test unit had to turn itself off after 3.5 hours. The Nexoc G739 is the winner of this round and lasts almost five hours in this test. Last but not least, we took a quick look at minimum battery runtime. With the Windows power profile set to maximum performance and at maximum brightness the test unit switches off after less than an hour. Apart from the Nexoc G739, which makes it to just over 2 hours, no other competitor gets over the one-hour mark. A large and fast gaming notebook at an affordable price. This is what the MSI GL72 wants to be. To be able to offer a gaming notebook for $1100, you have to make some sacrifices. This starts with the matte and elegant case. Unfortunately, it is made entirely of plastic. Workmanship and quality fulfil basic expectations, but could be better. Particularly annoying: Fingerprints "adorn" the case very quickly. The display has improved and is brighter than that of its predecessor, although this improvement is limited - our comparison devices had better displays to offer. The use of a TN panel is not up to date. All comparison devices were equipped with IPS screens. 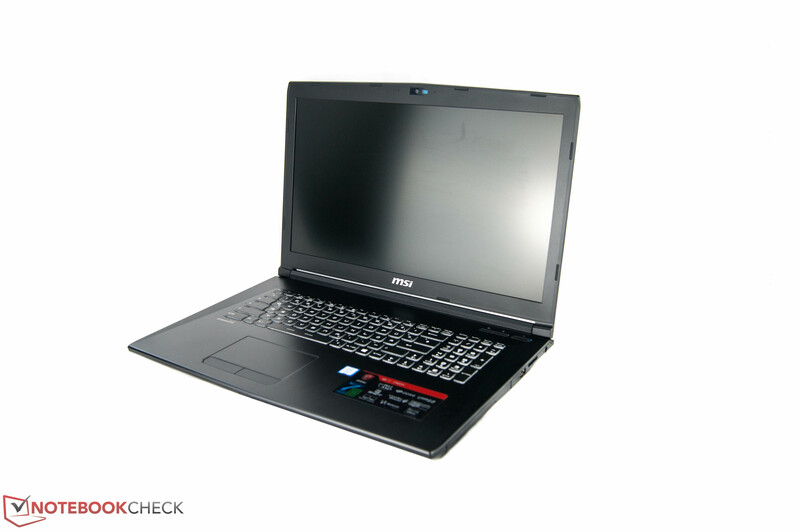 Apart from this shortcoming, the new MSI GL72 has one great advantage: its readiness to perform. The 17-inch laptop perfectly demonstrates how gaming notebooks should make use of their components. Noise level and temperatures remain at an acceptable level. 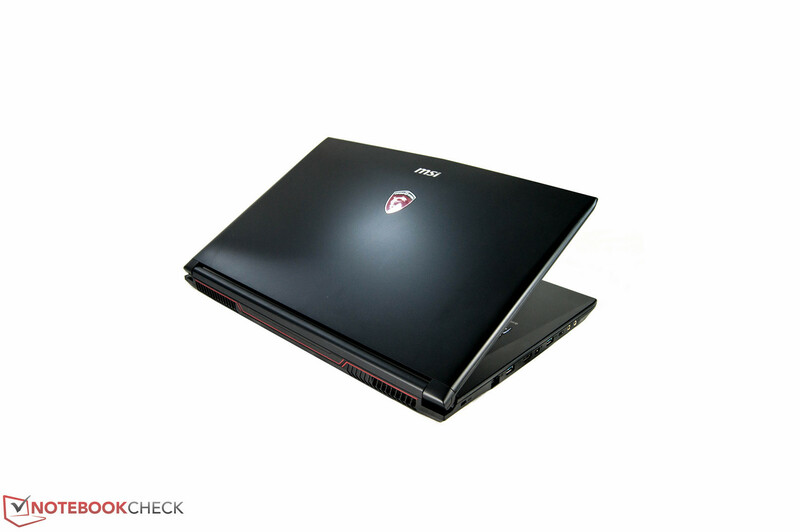 Casual gamers who are looking for a large notebook and have a clear idea of the price they are willing to pay will be quite happy with the MSI GL72. For a little more money you could also get a brighter IPS panel, PCIe SSD and a graphics boost with the Asus GL753VE or the Nexoc G739.